The farmer’s markets in our area just opened up and I visit eagerly anticipating the season’s upcoming bountiful harvest. One of my favorite farmers market purchases is the fresh zucchini. 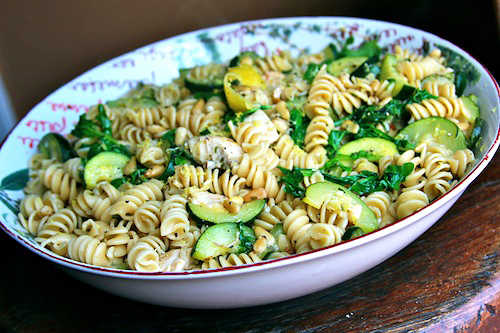 Zucchini is not yet on the stands, but I was reminded of this pasta I created last year using zucchini and lemon. I love the taste of arugula but baby spinach is a perfect replacement. One could take this recipe a step further and add feta for yet another flavor dimension. This recipe makes quite a bit and I enjoy it the next day for lunch as well. Zucchini is low in calories, saturated fat, cholesterol and sodium, and is a great source of dietary fiber. Zucchini also offers valuable antioxidants, trace quantities of the B vitamins, folic acid, small amounts of vitamin C and calcium, and a healthy content of potassium. Using lemon juice and the zest as the flavor base, the need for added fat in the sauce is eliminated. Deglazing the pan with wine grabs any remaining juicy bits left on the pan to further intensify the flavor. Pine nuts are loaded with beneficial antioxidants, fiber and monounsaturated fat that helps to control cholesterol levels by removing triglycerides from the body. Spinach can claim a special place among vegetables in terms of its phytonutrient content. Spinach is also an excellent source of other antioxidant nutrients including vitamin C, vitamin E, beta-carotene, and manganese, as well as a very good source of the antioxidant zinc and a good source of the antioxidant selenium. A main dish salad great for anytime of the year. Bring a large pot of water to a boil and add the fusilli, and cook until al dente. Meanwhile, heat 1 Tablespoon of oil in a large pan over medium-high heat. As the oil is heating, take 1 lemon and use a vegetable peeler to remove the peel into large strips. Add the zucchini, lemon peel and garlic to the large pan and sauté until zucchini just begins to brown. Remove zucchini and remaining bits and set aside on a plate. Remove lemon peel and discard (or use as a garnish). Heat the remaining tablespoon of oil in the same pan and add chicken. Sprinkle chicken with salt and pepper, and cook the chicken until browned and cooked through. Add the wine to deglaze the pan and bring to a boil until the wine is reduced by half, then add the juice from the first lemon and then add the zucchini back to the pan. Add the toasted pine nuts. Drain the pasta and add the pasta back to the empty pot, then add contents of the pan to the pot and mix to coat well. Zest the second lemon to add to the pot and use the juice of this lemon to add to the pasta. Add red pepper flakes and/or freshly ground pepper to taste, then add the spinach or arugula and toss until just barely wilted and transfer to a serving platter.